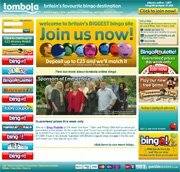 Tombola Bingo is a UK based online bingo site with a lot more to offer than the standard online bingo games. Oh yes, you'll find 75-Ball Bingo and 90-Ball Bingo, as well as the newest version of Shutterboard 80-Ball Bingo, but you'll also find other exclusive, unique games like Cinco and Hamster Race. There's even a free game of Lucky Pick that awards £20,000 in prizes every week. Owned by Tombola LTD and licensed in Alderney, Tombola Bingo sticks to the strict regulations of the European Union, ensuring security and fairness to all members. Tombola bingo has a massive game variety, well beyond the standard online bingo games. You can enjoy the traditional North American 75-Ball bingo game, the European favorite, 90-Ball Bingo, or the newest online bingo craze, 80-Ball Bingo. Tombola also offers an exclusive game called Cinco, as well as Hamster Race, Battleships, Rollercoaster and Bingo Roulette. The ticket prices are listed below. There's also a free Lucky Pick game in which Tombola Bingo pays out £20,000 each week in prizes. Tombola bingo is powered by Flash software, meaning you are never asked to download any files to play online bingo. The only download you may require is an Adobe Flash player, but if your computer was purchased in the last 5 years, that shouldn't be an issue. Since all games are played directly in your browser, tombola Bingo offers global OS compatibility (Windows PC, Mac and Linux). The lobby is user-friendly and easy to navigate, with good game controls for maximum playability. Auto-Daub is turned on by default so you can enjoy the chat instead of worrying about missing a called number, or even calling “Bingo!” for that matter. Winners are paid regardless of their attention span. The FAQ page at Tombola Bingo will easily answer most common questions about the games, technical stuff, bonus terms, etc, and is extremely well laid out in terms of navigation. However, should you need customer support, Tombola Bingo is fully staffed 24/7 to provide fast, reliable and friendly assistance via live chat, email and telephone. UK telephone lines are open 9am-10pm every day. Email responses can be expected within 24 hours, while telephone calls are generally answered within 30 seconds. The minimum deposit is £10, maximum £500. Players are not permitted to deposit more than £500 per week, and may not deposit if their account balance is already £250 or greater. Withdrawals are automatically processed back to the same method used to deposit. If a player wins using bonus credits alone, having made no prior deposit, withdrawals must be made via check. Deposits: Visa, MasterCard, Visa Delta, Visa Electron, Maestro, Switch and PayPal. Withdrawals: Visa, MasterCard, Visa Delta, Visa Electron, Maestro, Switch, PayPal and Check.